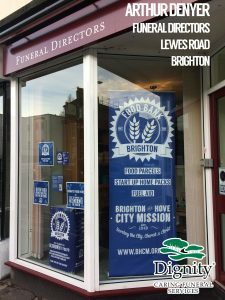 We are very excited to be having ever increasing opportunities to work with local business that want to get involved with raising awareness and funds, and collect items for the Brighton Food Bank. In the last year, we have formed fresh new partnerships with banks, supermarkets, office blocks and call centres, and many smaller businesses, including plumbing firms and nurseries. 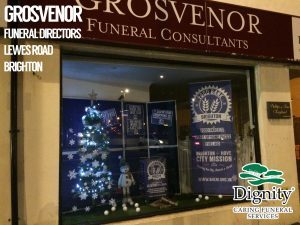 The most resent partnership is with Funeral Directors across our city. Many of them have welcomed our literature on ‘Leaving a Lasting Legacy’, as an increasing number of people are supporting local charities financially, instead of spending money on traditional flowers at the funeral of their loved ones. 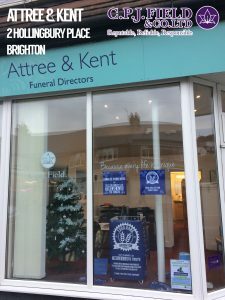 We are particularly thankful to Dignity Funeral Directors who have given us four shop windows to decorate throughout December and January, and Attree and Kent Funeral Directors who have welcomed us to display our Food Bank publicity, including flyers, a banner, a food bank bin, and bunting, in two of their shop windows. 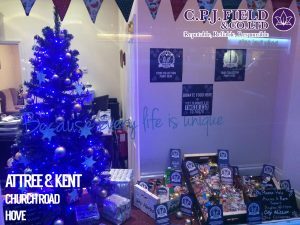 So keep you eye out for all six windows across Brighton and Hove during this festive season. Please be aware our Head Office will close on 21st December and re-open on 4th January 2017. Our Brighton Food Bank is open over the Christmas period, but only certain days, please click here to view when they will be available. Thank you, we wish you all a very Happy Christmas!